A Mass of Christian Burial is scheduled for 10 a.m. Friday, Sept. 14, at St. Anthony’s Catholic Church for Diana Wauneka Bustamante of Artesia. 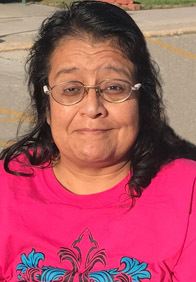 Bustamante, 49, entered heaven’s gates Friday, Sept. 7, 2018, at Artesia General Hospital. Fr. Frances Lazer will officiate the services, with interment to follow at Twin Oaks Memorial Park. Pallbearers will be Mateo Ramirez, Gabriel Montoya, Orion Bustamante, Salvador Bustamante, Gabriel Bustamante and Joseph Serrano. Honorary pallbearers are her grandchildren and her daughter. Visitation will begin at 10 a.m. Thursday at Terpening & Son Mortuary. A rosary will be recited at 6 p.m. Thursday at St. Anthony’s. Diana was born Oct. 19, 1968, in Big Spring, Texas, the daughter of Eleanor and Vicente Bustamante. When she was a child, the family moved to Artesia. She enjoyed being a member of the Artesia High School band, in which she played saxophone. She was a member of St. Anthony’s Catholic Church and would also attend Trinity Temple Assembly of God. She was a laundry attendant for 15 years at Soft Suds Laundry. She always stayed positive. Not a day would go by that Diana would not be smiling or laughing. The simple things in life meant the most to her. She would want everyone to remember her joy. Her faith in Jesus was a huge part of her life. She honored her parents; she was their caretaker until the end and always made sure they lacked for nothing. Survivors include her only child, Ashley Montoya and husband Gabriel, of Artesia; grandsons Mateo Ramirez and Jayce Herron, both of Artesia; granddaughters Aliezah Bustamante and Alexxxiz Herron, both of Artesia; bonus grandchildren Alexis Sosa and husband Carlos of Chaparral, Carlos Morales of Roswell, Trae and Tristen Montoya of Las Cruces, and J’ryn Carrasco of Artesia; brothers Silio Bustamante of Bend, Ore., Vicente Bustamante III and Juan Bustamante and wife Martha, both of Artesia, and Lucaz Bustamante and wife Pam, and Alcario Bustamante and wife Daisy, both of Virginia; and sister Margaret Bustamante of Artesia.